Friends….Spring is upon us and around the web I see everyone making beautiful and delicate salads with berries and sweet vinaigrette. How I envy your weather. I used to live that “good weather” life in Southern California…but now in Oregon, and don’t get me wrong, this is EXACTLY where I want to be…but, we are still having snow, rain, cold….the Winter trifecta will not seem to blow away. Even the dog doesn’t want to go outside these days. She’s over it too. Anyway, when it’s cold and you have to take food to the vineyard to eat, you must have something warm. And satisfying. A sandwich does not cut it people. Neither would a salad. 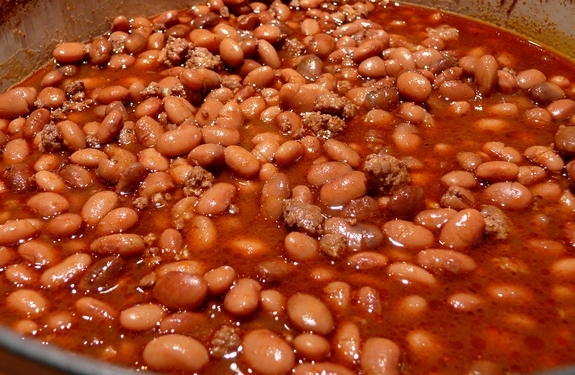 These beans are stick to your ribs satisfying and ARE SO GOOD. I accidentally came up with the recipe when making pulled pork which makes this recipe a two-fold, two-night extravaganza. But there will be enough food for a crowd or for your family for the whole week. It just has such a good, smokey flavor. Basically I made a seasoned pull pork one night. After I removed the pork from the broth, I happened to taste the leftover liquid. It was so flavorful, I couldn’t throw it out. I knew it would taste amazing with some beans, I was right. This dish resonates with flavor and is excellent served with lots of warm, buttery tortillas, fresh, homemade pico de gallo and sour cream. You will lick the bowl. I promise. I like to cook dishes like these over night. They warm the house and keep the oven free for the rest of the day. To a 7-quart Dutch oven, add pork shoulder and three cups of water. To the water add 1 Tablespoon kosher salt, 2 teaspoons Gebhardt’s chile powder, paprika, 1 teaspoon black pepper, 1 teaspoon cumin, garlic powder, onion powder and smoked paprika. Cover the pot and place in a 225 degree oven for ten hours. When the meat is done, let it sit and cool for a couple hours in the oven. Remove the meat and shred the pork with two forks, saving all the broth left-over in the Dutch oven. Serve with this East North Carolina BBQ Sauce. The pulled pork is not part of the bean recipe but yields the broth making up the background flavors for the beans. Trust me it’s worth it. Place the broth from the pork shoulder in the refrigerator for the day or over night. Discard the fat that accumulates on top. Meanwhile, rinse and carefully pick through the pinto beans looking for stones. Place in a pot and cover completely with water, adding 1 Tablespoon kosher salt. Bring to a boil and remove from heat. Cover and let sit until completely cooled. Drain water from beans. In a nonstick skillet, brown ground chuck and ground pork until no longer pink. Remove fat. 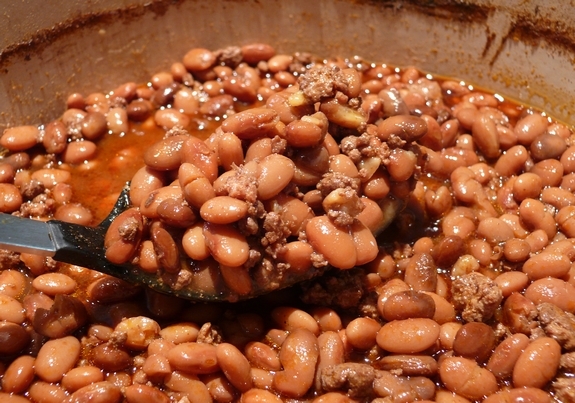 Add cooked pinto beans, ground chuck, ground pork and broth to a 7 qt Dutch oven. Add remaining 2 Tablespoons kosher salt, 2 Tablespoons Gebhardt’s chile powder, 2 Tablespoons New Mexico chile powder, 1 teaspoon black pepper and 1 teaspoon cumin. You will have to add water to completely cover beans. Cover the Dutch oven. Place in a 225 degree oven and cook for 10 hours (over night). Remove from oven and serve immediately or let cool and place in the refrigerator until ready to eat. They last for days when refrigerated. I can only imagine the flavor in these beans! Smoky is the key word here. I can taste them now. WOw this looks great for the weather here in Cheyenne, not quite spring yet still plent of time for some warm comfort food! Thanks for the receipe! I just came across your site because of the name. I have a Pinterest board called “Pigs and Cheese are Funny”! I’ll revisit often! These will be in the oven tonight for a going away luncheon at work tomorrow. I already have a tried and true Carolina Pulled Pork recipe which is cooking now, but one day I will try it your way. I’m using the rest of the recipe, especially the pork broth to make the beans. I have no doubt that they will taste just as awesome as they look here. Thanks Cathy! The beans sound fantastic and going to try it this weekend with my smoked ribs however, when and how much of the broth do I add to the beans? I’ve made these in a slow cooker………delicious.